Sony blows another release date. This time it's the 70-300mm G lens. Initially they were to ship 4/4/08 according to the website SonyStyle.com, now they list 5/2/08 as the new date. You would've thought they would learn their lesson after the first few mistakes, like the quasi DSLR R1; a month late; and the Carl Zeiss 16-80mm lens, which missed the release date by a good six months; and don't forget the newly released 55-200mm which was several months behind schedule. So now I won't be able to give you the review of the 70-300mm G lens in April (obviously) so let's try for May. In other news, I've been using the Sigma 10-20mm more often, and actually like it better than the Sony 11-18mm. The Sigma is sharper in the corners wide open and a little better handling CA. It also focuses much better on the A700 than the A100. Better yet, it's $100 less expensive than the Sony model. I hope everyone had a nice Easter Sunday. I did the usual, which included a big meal and a trip to the junk yard. 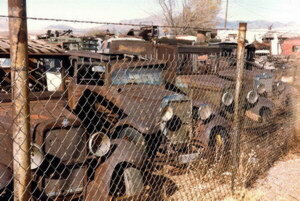 See my wonderful holiday trip to a junkyard in Huachuca City, AZ. Along for the trip was the Sony A700 and Sigma 10-20mm ultra-wide angle lens. The latest entry of my little mini-tours will feature the world famous Fort auto parts in Huachuca City, AZ. This junkyard is located along the main highway a few miles north of Sierra Vista, a town better known as the home of the "Buffalo soldiers." Fort Auto parts junkyard is known throughout the world for the mostly well preserved cars and trucks (and carriages) starting from the turn of the century--that's 1900 for all you youngsters-- all the way up to the 1960s and 1970s. It's also the shining star and most prestigious establishment of Huachuca city AZ. Check out the exciting 18 photos with text here. If you have a minute or two, check out my Odds and ends 3/18/08 page for a few pictures from the last couple of weeks. Also, people were looking for the telephoto shot comparisons I had of the 6mp KM5D and the 12mp A700 , which didn't look very different at all. I added those to the Sony A700 review page and some sharpening samples from the camera settings, all at the bottom of the page. Here's the Picacho Peak tour I promised you. March is prime time for this area if you like mild weather, wildflowers and hiking. Check out the tour, which includes 32 colorful pictures (all on one page, so dial-up users be patient, 5mb) using the Sony A700. If you're wondering what happened to all the stuff on the homepage, no need to wonder anymore. I put it in the home page archives, just click the month you think you saw it, or, check the Picture gallery page for tours etc. I've gone through all my lenses (for Sony) and tested them for focusing accuracy and speed on the A700, and inserted that information in the updated lens review pages. I've also included Bokeh in most of the reviews, though some lenses were rented and I wasn't able to retrieve that data. I can tell you that the A700 is much better at focusing than the A100, and from what I've read and heard, the A200 and A300 series are better than the A100 also. In the coming days look for a tour of Picacho peak, a state park and... site of the largest civil war battle in Arizona. Actually, it's now noted for the poppies that sprout up in the springtime. 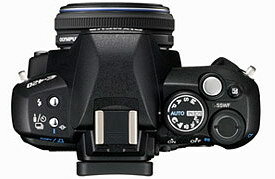 In other news today, Olympus announces an update to their already small DSLR. 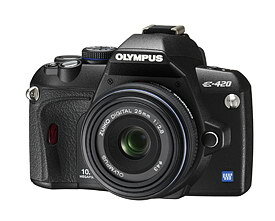 The E-420 is pretty much the same as the E-410 so no big deal here, but the most interesting item took a backseat to the camera unfortunately, and it's the little 25mm F/2.8 lens that'll be an option. It equals 50mm on the 4/3 system. Just look at the pictures below and see what I'm talking about. This combo may be the first DSLR you can fit in a jacket pocket. Supposedly it's a mere .9" or 23mm thick and will cost around $250 or $699 with the camera. I'd probably rather have a 35mm if it's going to be a prime, but that's me. Look at the neat little camera below for more info. No image stabilization, I guess you can't have everything. Just 380g without battery or lens. CF I &II slot, and of course xD. Shadow adjustment technology, same as DRO. wireless remote, or wired which are extra dough. 380g or 13.4oz without lens or battery. 25mm F/2.8 pancake lens: 95g 23mm X 64mm. Body 5.1" X 3.6 X 2.1 or 130mm X 91mm X 53mm. Priced at $499 for the body, $699 with 25mm lens, or $599 for regular kit lens. Available (US) in May '08.